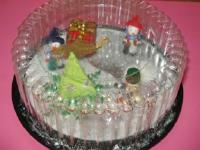 Children will use their imagination to create their very own snow globe! 1. Gather your material. 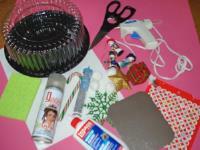 You will need a small disposable cake box with a clear lid, white Fun Foam, white glue and/or hot glue, glitter, glitter hairspray, metallic cardboard, Christmas stickers, a green sponge, cotton balls, scissors, and a variety of tiny Christmas tree ornaments and decorations (ask parents for decorations they no longer use). 2. Trace the contour of the cake box lid on the white Fun Foam. Cut out the circle. 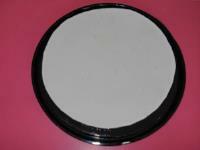 You may have to trim the circle to make it just a little bit smaller than the lid. 3. 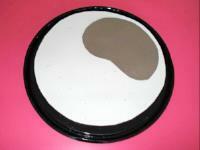 Glue the circle in the bottom of the cake box to represent a snowy surface. 4. Cut a skating rink shape out of the metallic cardboard and glue it on your snowy surface. 5. Arrange the tiny Christmas decorations as you wish. 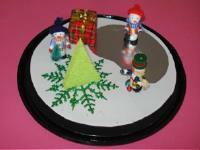 Cut a triangular shape out of the green sponge to represent a Christmas tree. You can use your Christmas stickers to decorate the tree. 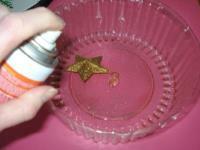 Using hot glue will guarantee that your decorations stay put. Keep in mind that children will be shaking the snow globe over and over again. 6. If you wish, you may also glue the string of an ornament to the lid so it will hang from the top of your snow globe once the lid is set on the base. Spray glitter hairspray (available around Halloween) on the inside of the lid. Let dry. 7. 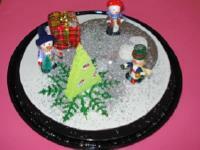 Sprinkle glitter all over your Christmas scene. 8. 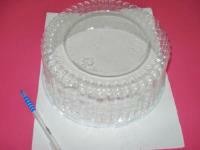 Apply glue around the contour of your cake box and press down on the lid to seal it in place. Wait for the glue to be completely dry. 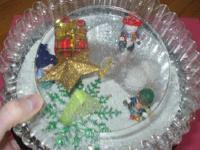 Admire your snow globe and enjoy shaking it to create a sparkly snowstorm.